Even if you're not going to be a stay-at-home mom 9r dad! ), and don't plan on using cloth diapers, breastfeeding, or making your own baby food, there's still tons of ways that you can save money as a parent. Some of these methods require a lot of work and dedication, while others are simple ways to save a few cents here and there. Before you know it, your pennies are turning into dollars, and you've got some money set aside for a college fund, or a fun rainy day activity! Just remember that each family is different, and that not all of these techniques will work as well for you as they do for me. But you never know! Give some of them a try, and you just may be rewarded! If you've ever been around a baby or child, you know how much stuff can accumulate over the years. A lot of times babies and children will out-grow clothes and toys before they will wear them out. Sometimes a "used" item is just like brand new, especially if it has been well taken care of. My advice: don't be ashamed to accept (and use!) hand-me-downs, and used gifts! Now, I know getting your Cousin Johnny's 1980's not-so-fashionable clothes can be embarrassing but there's nothing to say that you have to accept and use everything that people give you. When people offer you hand-me-downs, let them know that you've "been receiving a lot of things from other people", but you'd be happy to go through whatever they're offering and pick out the things that you still need. Even if you've not accepted a single hand-me-down, this is a perfect way to ensure that you won't end up with a load of things you don't like or don't need. 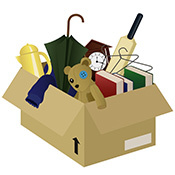 If they give you a box and tell you to get rid of whatever you don't use, try donating it to a local charity that provides clothes for needy children. When it comes to accepting used toys, you may want to be cautious. Things like pack-and-plays, swings, cribs, strollers, car seats and the like tend to have high recall rates. Just look the Brand and model number up on the internet (or use the Product Recall Finder provided by BabyCenter), and you should be able to find any recalls that are applicable. Some recalls are frivolous, and may ask you not to use a product because of poor parenting by others (such as "our chair is being recalled because children placed in it on elevated surfaces may fall out). Just use common sense as to whether or not a product is good for you and your family. In my community, there are three REALLY nice resale shops that only sell new and like-new items. They carry everything from clothes, and shoes, to bibs, strollers, car seats, bedding, baby gear and more! 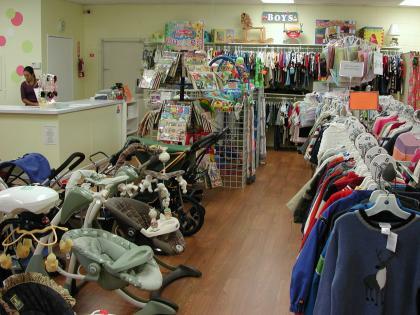 Some children's resale shops also carry maternity clothes and nursing tops. One of the best parts about (good) resale shops like these is that they do most of the work for you! Just like a "regular" store, they have clothes divided into gender and size, and they legally can't sell anything that's been recalled. My husband and I have purchased many items at our local resale shop, Spoiled Rotten, for a fraction of the price! Additionally, most resale shops will purchase your gently-used items in exchange for store credit or cash. It's a great way to make a few bucks on all the stuff you have laying around, or upgrade to the next item in your child's development. Mom to Mom sales can be a great thing. Please note that I stress the word CAN. I have been to a couple that have had great selection and quality items, but more often than not, they're a flop! Depending on which organization is hosting the event, sellers can either rent a single table and sell their individual items or crafts, while other mom sales are like going to a HUGE consignment store. 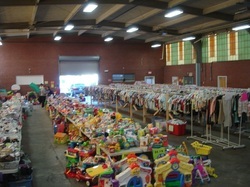 From my experience, the consignment sales are the best and tend to have the largest selection. The Moms of Multiples organization puts on excellent sales. Because they are mothers of multiples (twins, triplets, etc), you will find a TON of selection. They only accept new and like-new items (nothing that is worn-out or stained), and have very reasonable prices. Michigan has a list of Mom to Mom Sales that you can check out, to see if there are any near you. You can also search the internet for Mom to Mom (or sometimes called Mom2Mom) Sales in your area.